I graduated in medicine thirty six years ago, and entered the medical profession hoping I would be able to banish suffering wherever I went. Confident and brimming with knowledge, I embarked on further specialization in internal medicine and cardiology. As I worked in the hospital I soon realized, that many of the patients I was treating had chronic diseases like arthritis, hypertension, diabetes and coronary artery disease in whom little if any improvement actually occurred. The treatment being given, was usually symptomatic, which made the patient feel better, controlled the symptoms, but did little to cure, or even arrest the progress of the disease. Little emphasis was placed on tackling the factors which had caused that particular patient to develop that illness. This was obvious in all the conditions I saw. In the field of heart disease our emphasis was formerly on drug therapy, and is now on procedures like angioplasties and stents. The really effective measures to tackle the cause of the illness- like stopping smoking, controling blood sugar, reducing weight, regular exercise, clean air, change of diet and lifestyle are usually only mentioned in passing and are rarely implemented. In Diabetes, little emphasis is given to important measures which can prevent damage to the pancreas like stopping alcohol, reducing weight, high fibre diet, regular exercise, supplementation of minerals like zinc and chromium which help the body produce insulin and utilize energy. Many of the patients I saw in my early years, especially the elderly ones were suffering from pain. Then as now, little attention is paid to diagnosing and treating the cause of the pain. Pain is always a warning sign from the body that something is wrong and is our body's way of asking for help. Patients with chronic pain are usually prescribed one pain killer after another till the side effects of the treatment affect the patient. I was associated in the treatment of one such patient, a young 27 year old mother of two, suffering from Rheumatoid arthritis, a crippling and painful disease. She was treated with two very potent pain killers which failed to relieve her pain. She was examined by several senior physicians who decided to prescribe corticosteroids (Cortisone) for her. Unfortunately this combination of painkillers and cortisone caused severe bleeding from her stomach, and she passed away before any further treatment could be given. This sad episode, led me to assess whether modern Western medicine which I had spent long years studying was really the ideal answer to cure disease. A critical assessment, concluded that the way it was practiced it was mostly symptomatic rather than curative. I came to accept that modern medicine, like all systems of medicine had its weak and strong areas. While it does undoubtedly have effective solutions in crisis care, for many emergencies and acute, life threatening bacterial infections, there are a multitude of chronic diseases for which it has no effective solutions. In it's attempt to treat such diseases, Western medicine offers long term symptomatic treatment which usually has dangerous side effects. Hippocrates more than 2000 years ago said that "Patients would prefer an immediate alleviation of pain, to a remedy which would return them to full health. There is no doubt that patients are likely to disobey and by their disobedience bring about their own deaths." These strong words written by Hippocrates 2500 years ago show that human nature has changed little over these years! (Hippocratic writings Penguin Classic Edition, Page 136). Symptomatic treatment in modern medicine caters to this facet of human nature. Many patients prefer a quick symptomatic treatment rather than putting in the time, money and effort to find out why they have a problem and to treat its cause. The history of 20th century medicine is littered with tragedies arising from the use of drugs prescribed for relatively minor ailments, which caused horrendous consequences. Thalidomide and the piteously deformed children it fathered, are only one such tragedy. ​Over the years I came across numerous instances where western medicine not only failed to cure the ailment, but caused considerable damage to the patient. One particularly sad case concerned the nephew of a colleague of mine, who was himself an eminent surgeon. His prematurely born nephew was administered 100% oxygen in the incubator. As a direct consequence, a month later the child was discovered to have developed retro-lental fibrosis a condition which made the child blind for life. The tragedies associated with the use of Hormone replacement therapy, increasing the incidence of breast, ovarian and uterine cancer is very well known. The large number of deaths, associated with drugs prescribed to treat pain, like Opren, Viox and Celebrex over the last 20 years is also well known. The increasing corruption and incompetence in the regulatory bodies like the Food & drugs administration (FDA), ensures that we can not be sure about the safety of any of the drugs prescribed today, even though they have ostensibly been adequately tested for safety and efficacy. Western medicine today is driven by pharmaceutical companies who need to assure good returns to their shareholders and investors. Unfortunately in this process many inadequately tested drugs arrive in the market. In a few years their side effects become apparent, the drugs are withdrawn and patients left to suffer the consequences for a lifetime, while the pharmaceutical companies and their shareholders laugh their way to the bank. The other major driver of health care are insurance companies which dictate how a person can be treated, which tests can be asked for, which medicines prescribed. The physician is thus under pressure to conform to what is dictated by these two giants, rather than what is truly appropriate for the patient. In the 21st century, the drawbacks of conventional western medicine are increasingly apparent. Most treatments are symptomatic rather than curative, leading to patients requiring lifelong treatment with drugs. The lack of a scientific basis in western medicine, is evident from the fact that in every decade since the turn of the 19th century, books on Western therapeutics have completely changed. In no other system of medicine has one decade so decisively rejected the therapy of the previous decade as being not only useless but positively harmful. Many people including physicians like myself, have turned to older systems of medicine which have been tested down the centuries and have more complete and safer methods of treatment. It was while I was trying to learn more about such systems of medicine that I was introduced to Acupuncture. It is common knowledge that acupuncture is a remarkably effective method of relieving pain. I decided to study it in an effort to learn new skills which would enable me to help my patients even more. While I was studying acupuncture, I was approached by the brother of a physician colleague, whose eighty seven year old physician father, had been confined to bed with severe arthritis and cervical spondylosis for over a year. He had been hospitalized for a further five months without any discernible improvement. Not having any experience with acupuncture, I was reluctant to try and treat such a complicated case. However my colleague's brother was insistent and requested me to try and cure his father since he had tried every other treatment without any success. I commenced treatment and within a fortnight, the elderly gentleman who had been unable to sit up or stand without support was able to walk without assistance. He returned to his clinic in North India where he resumed his practice as a doctor till he passed away peacefully in the fullness of his years, fourteen years after I treated him. This first dramatic experience, of the efficacy of acupuncture persuaded me to continue my study of acupuncture. Over the years as I learnt and practiced acupuncture. I found that Acupuncture was very effective in tackling a range of illnesses including pain, backaches, asthma, allergies, loss of vision & hearing and a whole range of other conditions. Acupuncture is also equally effective in treating ordinary every day ailments. What makes it an attractive alternative to conventional western medicine, is that it frees a patient from having to take drugs and medication with potentially dangerous and toxic effects. Many cases confirmed this belief. Mr. Kumar, a middle aged gentleman suffered from crippling backaches. A successful industrialist he was being forced into premature retirement because of his problem. There were days when he could not even get out of bed because of the agonizing pain. Acupuncture gave him almost miraculous relief and after a short treatment his backaches were cured. Today, more than 25 years later, he has had no recurrence of the problem. Arthritis is another ailment for which conventional medicine has no treatment, and in which acupuncture is exceedingly effective. Mrs. Shah, an attractive 40 year old advertising executive, was unable to move her fingers due to the severe arthritic pain in he finger joints. She had been taking pain relieving medications for several years but with no effect. Within a fortnight of laser acupuncture treatment her fingers were completely free of pain and she has never had any problem since. Unbelievable though it may sound acupuncture is also able to help ailments usually considered incurable like blindness and deafness. Meenakshi, a young girl came to me more than twenty years ago with a severe loss of vision bordering on blindness in one eye as a result of chorio-retinitis. She had consulted ophthalmologists' all over the world without any success in improving her eyesight. Within two weeks of treatment her computerized perimetry test showed that her vision had improved substantially. After two months, one eye was near normal, and the eye that had been blind had improved so substantially that she had approximately 50 % vision in that eye. The ophthalmic surgeon who had been treating her before acupuncture commenced, certified that the tests supported this improvement. Her computerized perimetry charts are reproduced above. The white areas are areas of clear vision while the black areas are blind areas. The test is carried out by showing the patient six hundred to eight hundred discrete dots of light which accurately map the blind areas of the retina. 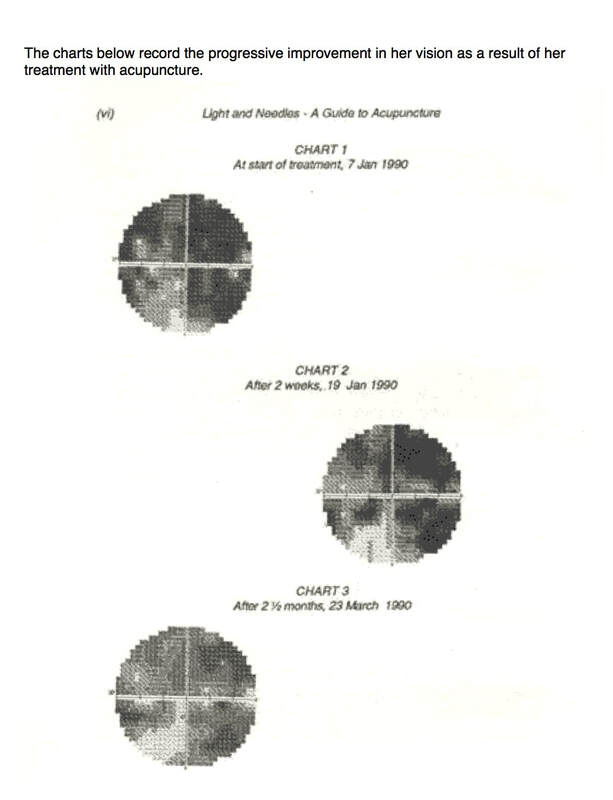 The charts record the progressive improvement in her vision as a result of her treatment with acupuncture. The philosophy behind treatment with acupuncture is interesting. Acupuncture is based on treating a person while he is well to prevent him from falling ill. In ancient China a class one physician was one who was able to treat an illness before it occurred. A class two physician treated the patient when he actually fell ill. In China when a person was well, he paid the physician to keep him healthy. If he fell ill, he stopped payment to the physician who was obliged to treat him free till he became well, including the cost of any medication. This system was preventive medicine at it's best as it gave the physician a vested interest in keeping the patient well. This is in contrast to modern medicine where the patient usually goes to a doctor only when he is ill, giving the doctor a vested interest in your falling ill! I have now been practicing acupuncture for thirty five years. I find it a useful and safe means of treatment. However it is not able to cure everything. Since acupuncture had been able to widen the number of conditions I could treat in conjunction with modern medicine I decided to explore and study other systems of medicine. Over the years I studied many different forms of medicine. Beginning with conventional western medicine, I moved on to study Acupuncture in both its Chinese and western forms, Cranio-sacral osteopathy, Bach flower remedies, iridology, ultrasound therapy, Homeopathy, Ayurveda, Bioresonance and and biofeedback. I discovered that each of these were useful in some ailments in some people, but none of them was a perfect answer which was effective in all diseases or in all patients. I found that all systems of medicine have their strong and weak points, and that I got the best results using a judicious mix of the best aspects of each form of medicine, individualized to the needs of each patient. I call this concept "Integrated medicine". After 36 years of practice I believe that all problems have solutions and we must attempt to find them, wherever they may be.